We feel like people fall into two categories: team regular potato and team sweet potato. If you're part of the former, you can stop reading now because this story doesn't apply to you. If you're part of the latter, you're in luck; we've rounded up the best super-easy sweet potato recipes for you to bring to whatever holiday party you may be attending this season (or if you just want to cook a delicious sweet potato dish all for yourself—you do you). From sweet potato wedges to chips, we've got all the bases covered with a variety of dishes to please just about every sweet potato lover out there. Scroll down to see the recipes. Potato wedges are always a crowd-pleaser, and with this recipe from Creative Homemaking, all you need to do is cut, season with chili and garlic powder, and bake. It doesn't get easier (or more delicious) than that. We are huge fans of baking our own chips; they're tastier and much healthier for you. 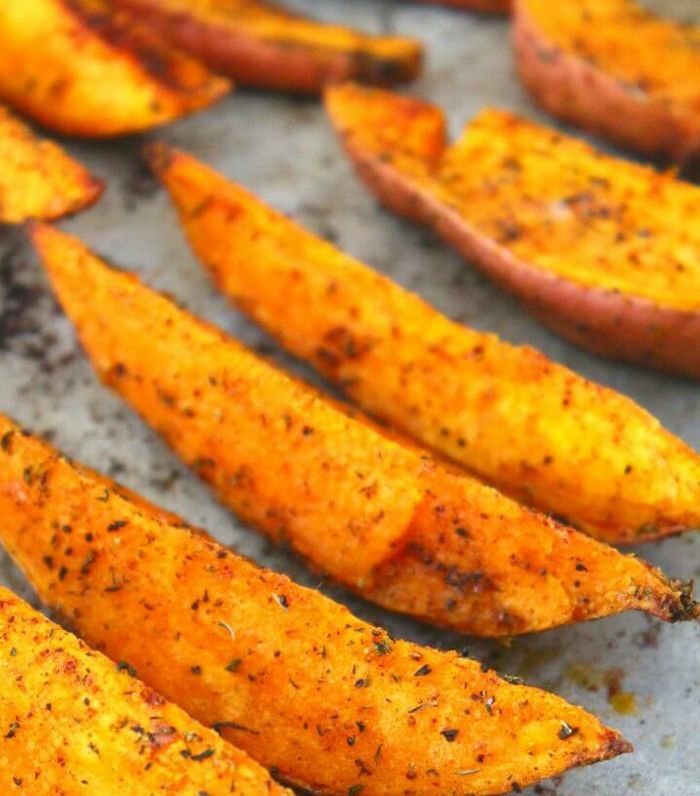 With this recipe from A Spicy Perspective, all you need are sweet potatoes, olive oil, and salt to make delicious appetizers we know everyone is going to love. What do you get when you mix sweet potatoes, coconut milk, curry, and mint? From Healthy Seasonal Recipes, an incredibly delicious, not-to-mention vegan and gluten-free, dish. Ciao Chow Bambina shows us how to pair sriracha mayo with sweet potato fritters for a really yummy appetizer that we'll be eating way past the holiday season. The secret to getting sweet potatoes as soft as the butter you slather onto them is patience. This recipe from Kitchn really only requires three ingredients and some wait time that is longer than the other recipes listed here, but trust us when we say it is totally worth it. A dish that tastes good and is aesthetically pleasing is totally doable thanks to this recipe by The Comfort Kitchen. You don't need that many ingredients, and the best part is that it only takes 10 to 15 minutes to make. Next up, check out healthy brownie recipes because yes, they exist.